Step right up! 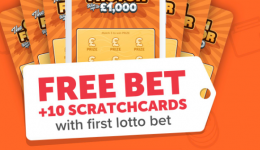 Sun Bingo are offering all new players an incredible welcome bonus so don't miss out. You'll get £40 to play with for free when you deposit a tenner. You can win big with free money. I do love a bit of online bingo and this is one of the very best sites in my opinion. Sign up today to take advantage of this great offer!